Richard Browning said his new goal was giving others the opportunity to fly. 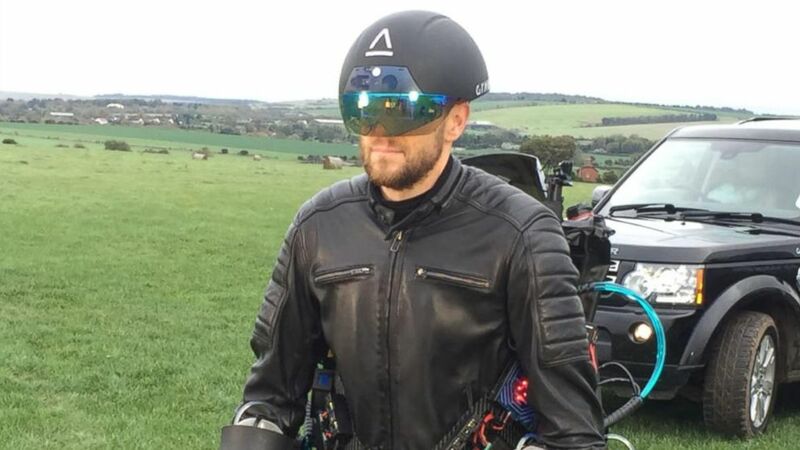 British inventor Richard Browning is a real-life Iron Man. Recently, Browning, the man behind the 1,050-horsepower, jet-engine flying Gravity suit, set a new world record for the "fastest speed in a body controlled jet engine powered suit." 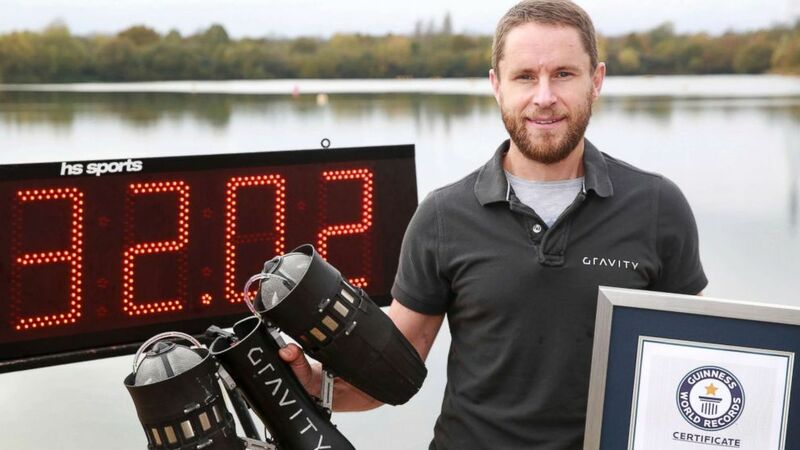 He achieved a speed of 32.02 mph over a lake at Lagoona Park in Reading, England, according to Guinness World Records. (ABC News) ABC News' James Longman tries on Richard Browning's jet suit. Browning told ABC News that in March 2016, he started tossing around an idea: "Could you approach the challenge of human flight in an entirely different way by augmenting the human body with power, with horsepower? ... Rather than putting the human being inside a flight machine." That question was the starting point for his flying suit. "This started out as, I suppose, an opportunity to go and try and achieve something that hadn't been done before," he said. "It was the challenge really. The sheer hell of the challenge. ... Learning from failure has been the fuel that's driven our journey." (Matt Alexander/PA via AP) Richard Browning poses for the media after setting the Guinness World Record for 'the fastest speed in a body-controlled jet engine power suit,' at Lagoona Park in Reading, England, Nov. 9, 2017. At the time, Browning was working for an oil company, handling oil trading and implementing new technology. In his free time, though, he pursued several projects. "I suppose that throughout my life, especially as a kid, I used to enjoy making things, taking things apart, visiting my father in a workshop," he told ABC News. "I suppose that I have always been quite technically minded in, at least, my day job career." He described the jet-suit as a project that "got slightly out of hand." First, he started with one small gas turbine attached to arm mounts. Eight months later, at a nearby farm, he had a breakthrough when he attached an engine to each leg and two turbines on each arm. He managed six seconds of controlled, stable flight. Later, he added two more turbines. 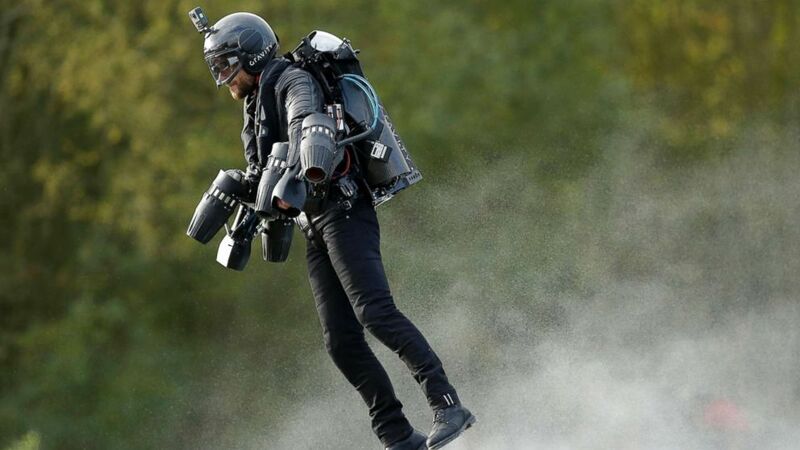 The current jet suit includes six turbines, a fuel system and an electronic control system. "Core to this journey has been ... a very strong ethos, very close to my heart, around having an idea and spending less time agonizing over whether it's going to be possible and more time about finding some way of turning that idea, that concept into something tangible and go and test it," he said, "and learn from that testing." (ABC News) British inventor Richard Browning is a real-life Iron Man. He recently set a new world record for the "fastest speed in a body controlled jet engine powered suit." 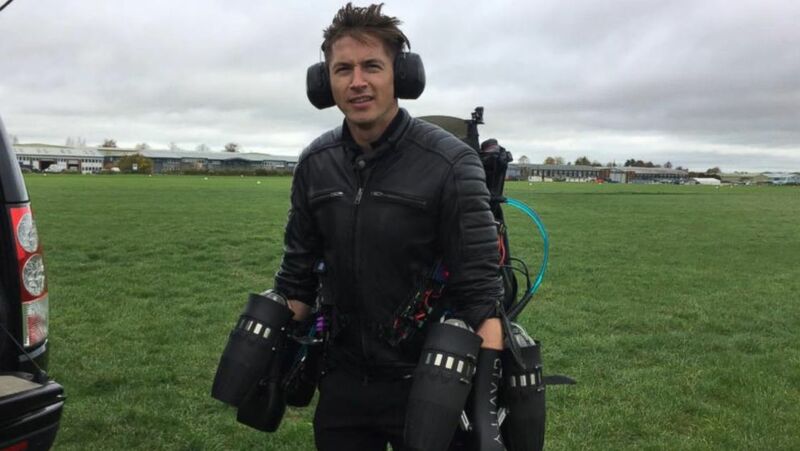 His company, Gravity Industries, made a deal with its first investor in early 2017 and has already sold a copy of the original jet suit. Browning said that while the Marvel character Iron Man had not been the original start point for the jet suit, he remains a fan and loved that people made that connection with it. "It is wonderful, especially with kids," he said. "They draw this great parallel." His goal, Browning added, is to make flying a reality for more people. "I know we're only at the beginning of this journey," he said. "I can't help but be quite excited about the journey we're on. It's a pleasure." (Tim Ireland/PA via AP) A British inventor, Richard Browning, billed as a real-life version of the superhero Iron Man, sets the Guinness World Record for 'the fastest speed in a body-controlled jet engine power suit,' at Lagoona Park in Reading, England, Nov. 9, 2017.